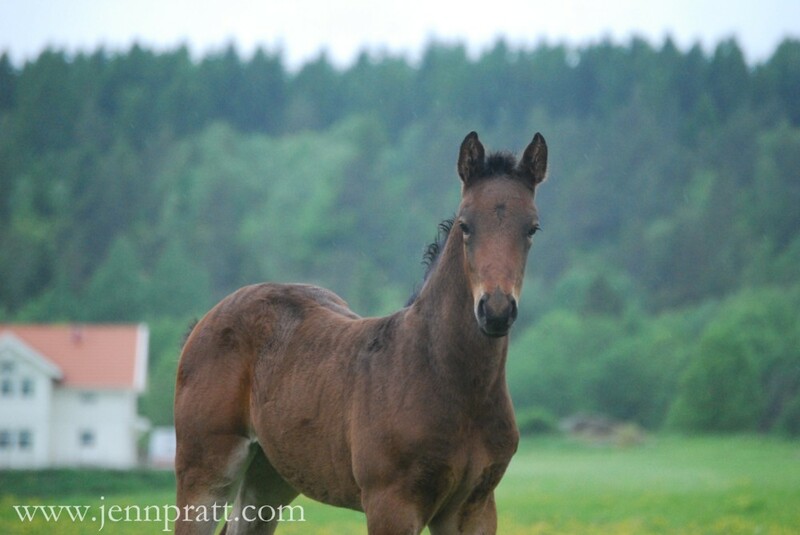 My Trip to Sweden ~ Part I of II | Jennifer Pratt Equine Artist. Hi Friends ~ I”m back 🙂 I’ve been here at my computer for two days trying to decide how to write this blog post on my Swedish horse adventure. My trip was so full, collecting all my thoughts seems like a monumental task at this moment. I’ve decided to break my post up into two parts. Part I will focus on my days at Ale Ridsport with my host Maria Linden in Älvängen, Sweden. Part II, I will write about three other farm visits I had in the country and the amazing people I met along the way. I hope you enjoy learning about my travels and thank you for reading. As always, comments are welcome and appreciated. Links of interest are highlighted, just click them for further information. Once we started our Swedish road trek to the horse farm in Älvängen, one thing was immediately noticable; There are horses literally everywhere in Sweden, this is a horse lover’s heaven! In my home of Ontario we have areas rich in horses, but in Sweden it would appear to be the norm across the countryside. I checked the facts today from the Swedish Riding Horse Association Statistics page and my inkling is true – Equestrian Sport in Sweden is second only to Football (what we know as Soccer here). Sweden has a rich history in horses, boasting one of the highest horse populations in Europe. It is also said they have some of the strictest of Animal Welfare regulations to ensure their well-being beyond the value they have for humans, and that they are allowed to live and act naturally as a horse. Arriving at Ale Ridsport was a moment of excitement. Months of correspondence over the internet with my host Maria had taken place, and now actually being there was very surreal. I know she would agree, finally meeting face to face was effortless, natural and comfortable – ‘like we had known each other for a long time already’. One stand out is the sheer kindness and generosity of her and her family to invite us to her home, into her life and accept us with open arms. She put us up in a charming Swedish cottage on her farm – and it was everything you imagine in your head to be. Peaked roof, loft bedroom and Ikea furniture. Dutch rider and trainer, Albert Voorn arrived for his clinic on Friday morning. He remembered me immediately from our meeting in Canada almost 8 years ago..Small horse world we both say. Albert hasn’t changed one bit 😉 Over the course of the weekend, riders progressed under his tutelage and I met local horse people and artists. I had planned to take many photos, however it poured rained for a good portion of my farm visit. One morning I ventured out to photo Maria’s foals, despite the conditions. As many of you already know, I have a keen interest in learning sporthorse bloodlines and I was very eager to learn more behind the breeding of each of the foals. This filly (below), is “Anytime” by. Aerline H (Cortez – Nimmerdor) dam is Candyline H, a great mare-line that has produced a lot of GP-horses, by Elmshorn (intl GP-stallion). She is also full sister to After Eight who was sold to international GP rider, Royne Zetterman. She had a super temperament and very curious with my camera in the field. I would love to see her again after she has finished shedding out her fuzzy foal coat. Probably one of the funnier, yet embarrassing moments of my trip happened during my photo session with Pallie. Mid shoot I felt a burning sensation on my backside (okay, yes my buttocks). I tried to ignore it, but it wouldn’t go away, and in fact got worse as the seconds went by. I had to let everyone helping with the shoot know something was stinging me – badly. There I was squealing across Sweden’s countryside and jumping up and down – ‘it burns! !, it burns!! !’ Feverishly digging my hands down my pants I eventually pulled out an ANT..a red ant.. a ‘Swedish-red-stinging-ant’ which left my buttocks burning and red for a few hours..so yes, that is the first time I can ever say I actually had ants in my pants..
That’s it for part I. Part II will feature a few new friends I met on my trip; Ida Finn-Melander, who shared a bit of her life as a horse person in Sweden and her life experiences working for Paul Schockemöhle; jumper rider Sofie Andersson from Malmö and her beachfront horse farm, and lastly a photo session with a lovely 3-year-old Swedish Warmblood gelding by Tornesch. It sounds like you had a wonderful time and have made a new lifelong friend in Maria. I had visitied Stockholm for the ’86 WEG and absolutely loved it, but, we didn’t venture out into the country to see all the farms. I’m looking forward to Part II of your adventure and can’t wait to see the work that will come out of this inspirational trip. Your trip sounds fantastic!!! and Can’t wait to see your new work coming out of the trip!! So I finally watched the video… 😉 Yes I want to ride your horse, but I don’t think ABBA need worry about being dislodged as the Swedish singing icons! I am so glad that you went on that trip. I think the benefits of it will resound in your life for years to come!!! Yes, I had forgot about that “ant in your pant”!=) Lol. They really don’t use to bit that hard, so it must have been an angry one..? Lovely pictures too! I’m really excited to see the final result of the paintings. I’m absolutely sure that they will look amazing! thank you, I think I’m maybe a better painter than writer. ?..and the ant – perhaps it was just a sensitive area ?? because let me tell you, I hurt like hell!! lol…thanks for writing Maria..I will be starting the studies sooner than later!